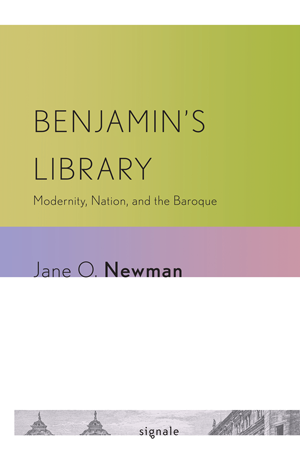 In Benjamin's Library, Jane O. Newman offers, for the first time in any language, a reading of Walter Benjamin's notoriously opaque work, Origin of the German Tragic Drama that systematically attends to its place in discussions of the Baroque in Benjamin’s day. Taking into account the literary and cultural contexts of Benjamin’s work, Newman recovers Benjamin’s relationship to the ideologically loaded readings of the literature and political theory of the seventeenth-century Baroque that abounded in Germany during the political and economic crises of the Weimar years. To date, the significance of the Baroque for Origin of the German Tragic Drama has been glossed over by students of Benjamin, most of whom have neither read it in this context nor engaged with the often incongruous debates about the period that filled both academic and popular texts in the years leading up to and following World War I. Armed with extraordinary historical, bibliographical, philological, and orthographic research, Newman shows the extent to which Benjamin participated in these debates by reconstructing the literal and figurative history of sixteenth- and seventeenth-century books that Benjamin analyzes and the literary, art historical and art theoretical, and political theological discussions of the Baroque with which he was familiar. In so doing, she challenges the exceptionalist, even hagiographic, approaches that have become common in Benjamin studies. The result is a deeply learned book that will infuse much-needed life into the study of one of the most influential thinkers of the twentieth century. Jane O. Newman is Professor of Comparative Literature at the University of California, Irvine. She is the author of Pastoral Conventions: Poetry, Language, and Thought in Seventeenth-Century Nuremberg and The Intervention of Philology: Gender, Learning, and Power in Lohenstein's Roman Plays. Newman is the translator of Time, History, and Literature: Selected Essays of Erich Auerbach, edited by James I. Porter.